When the red, blue and yellow bus pulls up at preschools, kids and teachers love it. So does Ben Voss, who operates TumbleBus Hawaii -- a gym on wheels. "When you're working with kids, you can't have a bad day," he said. "Kids are so happy on the bus, you can't help being happy. You've made a difference in someone's life that day, even though they're only 3 years old." He's especially excited about the goTumble Program sponsored by the Hawaii Medical Service Association for Head Start children and others in low-income areas. "It allows us to go to areas we couldn't go to before because we have to pay staff and gas and overhead," he said. "HMSA allows us to reach these kids who might not be exposed to something like this and kids, rather than go on the path of obesity, will go on the path of physical activities." 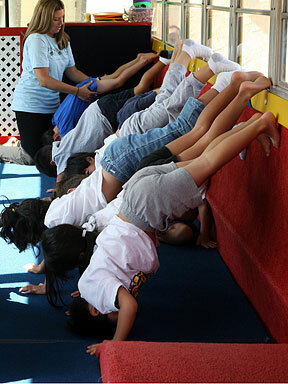 Voss started TumbleBus Hawaii in 2001, taking his mobile gym to different preschools weekly to introduce kids ages 2 to 5 to gymnastics and teach them some physical fitness skills, such as tumbling, forward and backward rolls, and other exercises. "It's almost like an extracurricular activity, a month-to-month program," he said. The bus has a variety of equipment and two staff members trained in preschool gymnastics are on the bus at all times, he said. Voss said HMSA helped with the purchase of a second bus after sponsoring a three-year goTumble program, now entering its second year, and he's thinking about adding a third bus this year. The program offers a weekly class for six weeks at no cost to schools and families that meet certain criteria. In the first year, the program reached nearly 3,000 Oahu preschool children with positive results, said Chris Jackson, Oahu Head Start health and disabilities manager. "Children are much more excited about physical activity on a daily basis," she said. Teachers also incorporate physical activities in the activities after the bus rolls away, she said. "In terms of seeing a change in children's actual growth, we can't necessarily attribute that to the TumbleBus," Jackson said. "But kids are excited about exercising. They're talking about good nutrition and taking care of our bodies." "Our students are so excited," said Lisa Leafa-Tavuli of Ben Parker Head Start. "During free play, they practice the exercises they've learned." Penny Shiira, Jefferson Pre-Plus Head Start teacher, said, "We talk more now about good health, exercise and being strong." The goTumble Program served 67 preschools in its first year, 37 of which were Oahu Head Start classrooms. Voss selects other schools from low-income communities. HMSA's three-year goal is to interest 10,000 children in daily physical activities that they will continue. "One of the highlights we enjoy is when we go to Waianae-Nanakuli," Voss said. "Those kids never get anything like this out there. Kids are happy; teachers are happy. We love it. "Every week it's a different setup," he explained. "We do different adventures every week and put a theme to them. It's 'Happy Feet' this week. Last week, it was 'Shrek.' "
He said the TumbleBus Program offers teachers a DVD on exercise with kids and a mini-lesson plan for daily activities. The TumbleBus fee for parents or schools that aren't eligible for the HMSA program is $45 per student per month for a once-a-week class. Two schools pay for classes for all their children, Voss said. 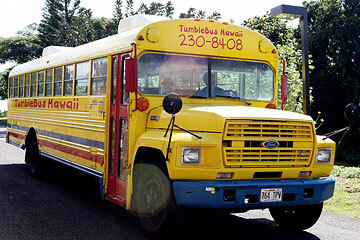 For more information, call TumbleBus Hawaii at 230-8408.